Earlier this March (2015) I received an email about an uplifting story from Japan involving one of our industry leaders, Ricoh, and its efforts to help earthquake and tsunami victims recover their photos lost amidst the horrible disaster that occurred four years ago, on March 11, 2011. The story moved me in several ways, and it also made me proud to be part of the worldwide imaging and printing industry. Q1. Can you share more information about where the photos were found, and if there are any especially interesting/poignant locations or situations? A1. Due to extensive damage to the buildings and roads caused by the earthquake, there was a lot of debris. As teams began to clear away the rubble, photos that were scattered on the ground were collected by the first responders. Then, those photos were gathered in one location by people from government organizations, private sector NGOs and NPOs, and other volunteers involved in initial recovery support activities. Q2. Any accounting for the large disparity in returns - from an average of 22% to a peak of 59% in the one center? A2. This project proceeded largely with the help of local government, which enabled a stable and long run of returning photos. In some local governments, it was clear which department we should work with for this project, while in other areas, it was not as clear. The photo center that had the highest return ratio was the one where it was clear which division of local government we should begin working in concert with on this project. This collaboration enabled returning photos continually over a longer period, and lead to a nearly 60 percent returned ratio. A3. We’ve now returned 91,477 photos as of March 25, 2015. Following the launch of this project in August 2011, photos began being returned in September of that same year. As for your second question, there are no more photos being found so the number of photos digitized will remain at 418,721. Q4. When missing photos are identified are the owners provided with printed versions or digital only? A4. Basically, what we returned were the original photos. We also returned digital data to those who asked for it. It was Friday, March 2011 when here in the US we got word early in the morning that Japan had experienced a very powerful earthquake and tsunami. The news sounded very grim, and I remember it becoming a bit more personal while during a meeting coffee with a friend a favorite coffee shop, she received a text message from a mutual friend who was in the Narita (Tokyo) airport, planning to fly back to the US but dealing with interrupted air travel. Also making it more personal was the contact I received later in the day from my University’s Public Relations representative, looking for a media contact in the form of an economics professor (me) to speak to local news representatives about the potential financial impact of the disaster. The connection never materialized that afternoon, but as I saw the local news that evening focus on the potential for our local economy to gain as a result of rebuilding across the Pacific in Japan, I felt very ashamed to be part of a society jumping so quickly to economic prospects with not nearly enough attention paid to the human suffering and loss. The shallowness of this short-term, economic-focused view has bothered me ever since. Something about filling out an NCAA basketball tournament bracket this time of year just seems the right thing to do - a true rite of Spring. And though it can be done online, to me at least the process just doesn't feel right unless it's via an old-school, printed bracket. This year, I'm doing mine (only one so far anyway) using the Printable PDF that comes from SB Nation, and can be found here. As far as hardware, I printed this one - ready to fill out - on my HP Chromebook and printed on my HP LaserJet 1102W, via Google Cloud Print. My very first photo with the Canon SX520 - Mourning Dove in the backyard beds. Not the greatest shot but still a nice way to start! A few minutes later, the bird (one of three) moved to the fence and was quite patient! A few days ago, I made the decision to pull the trigger and get a new "super zoom" digital camera as this year's spring birding season starts in earnest. My attention quickly was drawn to a $200 model, the PowerShot SX520 by Canon, my preferred supplier, which offers 42x optical zoom with very high user reviews (the newer SX530 takes it up to 50x, but the price more than doubles). I had long ago decided I am not interested in making a bigger commitment to standalone cameras (e.g Digital SLRs), and my iPhones and related gadgets have taken over for about 90% of my digital photo needs, but that big zoom is something necessary for good bird shots and those phones and tablets can't touch, and my old Canon "only" goes to 20x. Impressed! 42x zoom gets the moon to start to fill the frame! So the camera arrived and I have a little time to get acquainted with it! And somewhat magically, after I got it unpacked, with battery and SD card installed, my first shooting opportunity turned out to be three backyard Mourning Doves which proved fairly cooperative subjects. I say "magically" because though the Doves are frequently present in the neighborhood (seemingly more so in recent years) and we even had an observable nest a few years ago in the backyard sycamore, to see three on the ground, and then lingering on the fence, was an all-time first for me and led to some great moments for my initial experience with the new Canon. I will be posting more about my experiences and comparisons with the old one, but for now I am quite pleased, after last night's inaugural shots and today's walk-in-the-park, though I found out that shipping with a charged battery was a delight but not to assume it's a fully charged battery! My new camera - Canon PowerShot SX520 16 Megapixel Digital Camera with 42x Optical Image Stabilized Zoom with 3-Inch LCD (Black), $199 via Amazon. 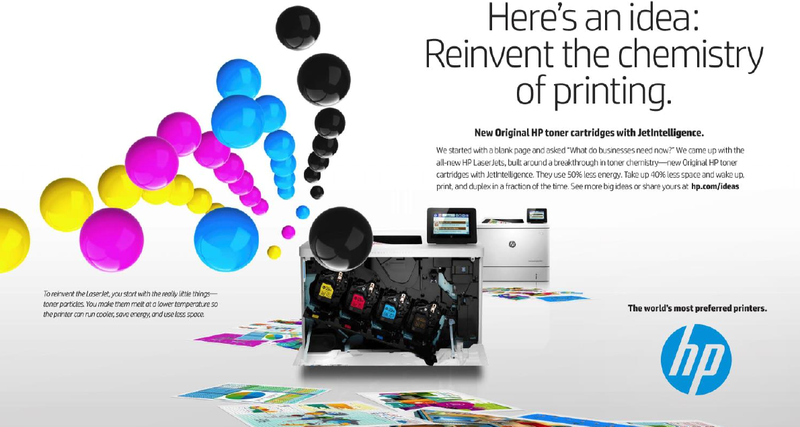 Today, HP announced a new toner formulation - JetIntelligence - that allows three new printer/MFPs also part of today's news - to deliver more energy efficient, faster printing from smaller footprints. Some of my thoughts on this latest step, and the all-important nature of the toner when it comes to laser printing, can be found in my guest post at Actionable Intelligence, "It All Starts with the Toner..."